This article is about the body part. For other uses, see Forearm (disambiguation). The forearm refers to the region of the upper limb between the elbow and the wrist. The term forearm is used in anatomy to distinguish it from the arm, a word which is most often used to describe the entire appendage of the upper limb, but which in anatomy, technically, means only the region of the upper arm, whereas the lower "arm" is called the forearm. It is homologous to the region of the leg that lies between the knee and the ankle joints, the crus. The forearm contains two long bones, the radius and the ulna, forming the radioulnar joint. The interosseous membrane connects these bones. Ultimately, the forearm is covered by skin, the anterior surface usually being less hairy than the posterior surface. The forearm contains many muscles, including the flexors and extensors of the digits, a flexor of the elbow (brachioradialis), and pronators and supinators that turn the hand to face down or upwards, respectively. In cross-section the forearm can be divided into two fascial compartments. The posterior compartment contains the extensors of the hands, which are supplied by the radial nerve. The anterior compartment contains the flexors, and is mainly supplied by the median nerve. The ulnar nerve also runs the length of the forearm. The radial and ulnar arteries and their branches supply the blood to the forearm. These usually run on the anterior face of the radius and ulna down the whole forearm. The main superficial veins of the forearm are the cephalic, median antebrachial and the basilic vein. 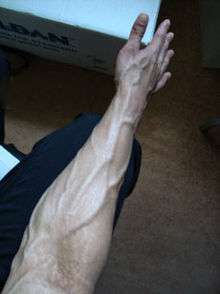 These veins can be used for cannularisation or venipuncture, although the cubital fossa is a preferred site for getting blood. "E/I" refers to "extrinsic" or "intrinsic". The intrinsic muscles of the forearm act on the forearm, meaning, across the elbow joint and the proximal and distal radioulnar joints (resulting in pronation or supination, whereas the extrinsic muscles act upon the hand and wrist. In most cases, the extrinsic anterior muscles are flexors, while the extrinsic posterior muscles are extensors. 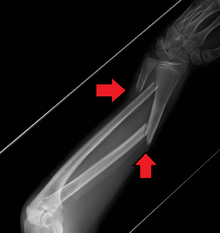 The anconeus is considered by some as a part of the posterior compartment of the arm. Median nerve – principle nerve of the anterior compartment (PT, FCR, PL, FDS). anterior interosseous nerve (supplies FPL, lat. 1/2 of FDP, PQ). Radial nerve – supplies muscles of the posterior compartment (ECRL, ECRB). Deep branch of radial nerve, becomes Posterior interosseus nerve and supplies muscles of the posterior compartment (ED, EDM, ECU, APL, EPB, EPL, EI). Ulnar nerve - supplies some medial muscles (FCU, med. 1/2 of FDP). ↑ "Dissector Answers — Axilla & Arm". Archived from the original on 3 January 2008. Retrieved 2008-01-17. Wikimedia Commons has media related to Forearms. Look up forearm in Wiktionary, the free dictionary.